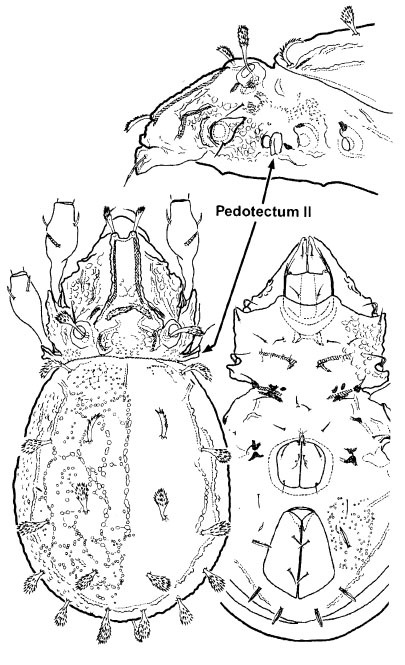 Lateral (above), dorsal (below left) and ventral views of Epieremulus sp., from Norton & Behan-Pelletier (2009). The Anderemaeidae are a group of oribatid mites found in temperate regions and at higher altitudes in the tropics. Characters (from Norton & Behan-Pelletier 2009): Length 280–850 µm. Gnathosoma normal; chelicerae chelate-dentate, with two setae; fixed digit of chelicerae with unsclerotised lobe with 7–10 small teeth. Prodorsum with costulae, without true lamellae; bothridium with internal spiral thickening; tutorium, humeral apophysis, parastigmatic enantiophysis S and enantiophysis V present. Notogaster oval; octotaxic system absent. Pedotectum II present. Tarsus II with two solenidia. [NB-P09] Norton, R. A., & V. M. Behan-Pelletier. 2009. Suborder Oribatida. In: Krantz, G. W., & D. E. Walter (eds) A Manual of Acarology 3rd ed. pp. 430–564. Texas Tech University Press.